IMPORTANT! You must enable Voice option in your phone configuration menu and also install your language file from the same menu. 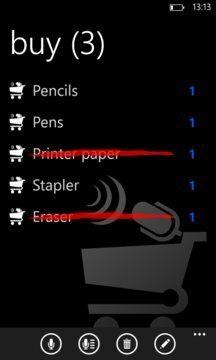 Voice Shopping List is a practial an easy tu use shopping list application. Products can be added to both the voice (it would be the recommended option) and typing. You can dictate all the products at the same time and Shopping List Voice are been creating the list automatically. ating separate the corresponding list. Plus you'll save on your phone so many shopping lists as you consider necessary, either, to keep buying products classified manner or to reuse lists at any time. 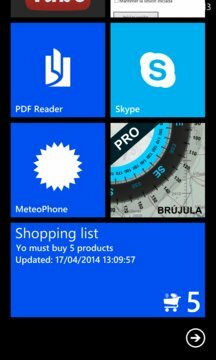 We have also included a Live Tile that informs you of how many products you buy earrings in your active list.